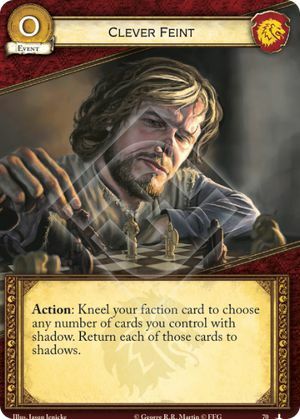 Action: Kneel your faction card to choose any number of cards you control with shadow. Return each of those cards to shadows. A card that has been blanked no longer has the shadow keyword, and thus cannot be returned to shadows with Clever Feint. When a card returns to shadows, it leaves play. Any attachments on it are returned to hand (or discarded if terminal), any lasting or delayed effects expire, all duplicates are discarded (if you do not choose to save), and all tokens are returned to the treasury.